The NHS, it does so much and yet it means much more. When our churches just provide sets for weddings and politics provides, well, you know, where are we to project some sense of worthy togetherness? The World Cup is around the corner so perhaps football might give us a swell this summer, leave the bunting up from the Windsor Wonderland for another couple of months. But we know our symbols are exactly that now, don’t we? We know we are doing these institutions work for them, that we are building palaces and princesses within our collective imagination, even in antipathy. The NHS has symbolic value, it is this country’s soul. But it is of course more than a symbol, it is carnal as well as divine. In Resuc with my Mum in The Royal London, a 3 star Michelin, academy of excellence the corporeal is all too real and life and death meet here upon the immaculate and bloodless floor. Mr Martin Griffiths arrives at the foot of her gurney, her head is lightly bound to blocks and around her all are in scrubs except for the police and they cluster in interdepartmental huddles. Forms are grimly signed. My supine and broken Mum remains charming with what little breath she has. The medical staff so ceremoniously astute that in the midsts of death we are in life and Mr Martin Griffith is wearing a suit that reassures. English, affable, occasional twitter nemesis of Trump, but then who isn’t, he is nightly stitching and saving stabbed youths and he is calm as he says we (he) need(s) to immediately operate on my Mum’s perforated bowel or, well, you know. Other surgeons, Mr Uff, neurology, sternly plans the surgery upon her spine that will follow. Trauma nurses comfort plainly without sentiment. Away she goes, my dear old Mum into limitless corridors and wards, into the hands of the devotees of this sky high principle of dedication, togetherness and salvation. On July 5th 1948 the National Health Service was born, ‘Thanks for the Second World War, it’s the least we can do’ is the jaunty subtext. Barbara Brand was two years old that day and her life has been held up by the institution that shares her birthday and her spirit, her will to live, her inner healing power. These two Mothers stand side by side in my mind. In my mind this spirit is something they share, this unseen and unseeable thing is somehow unified. No one who has spoken to a trauma surgeon or any member of their team could for a moment doubt the fundamental significance of science, material, rational science, experience, competence. We are dealing with world class experts here who meticulously understand biomechanics. But there is an art too, there is intuition, an ‘inner tuition’. There is indubitably a faith, a belief. ‘It’s the only place to work’ says Andrew **** the senior trauma consultant when I thank him. A deity, actually I mean a God, who lives only in our hearts will never have the power of a living and practicing source of salvation instantiated through the belief and sacrifice of a community. We all pay our taxes, we believe that the sick have a right to be healed, we accept that there are times when we will all be vulnerable, that in truth and in fact we are all one – what else is a nation but the belief that we are all, somehow, bound? The NHS is the very best of us, it is a living, breathing, healing mother goddess born of war and sacrifice sustained by love and dedication. A head on collision at 100 miles per hour, both cars totalled, strewn across a lane. Passers by don’t pass by, they stop and help. They haul the ‘screaming and bloodied’ woman from the back of the car. When I see her she is already medicated and understandably in shock. ‘I wish that hadn’t happened’ she says. Her chemotherapy completed just three weeks before, they ring a bell on the Sunflower Ward whenever a patient completes chemo, a positive knell, for once, ‘Ask not for whom the bell tolls, it tolls for thee’ and here she is in the adjacent A&E at Queens Hospital Romford, in a scene that were it not so sad would be funny. The scans come back, each bleaker than the last; broken neck, internal bleeding, broken back, sternum, ribs… ‘It’s very serious’ says Darren, head nurse before she is rushed to the Royal London Whitechapel, my Uncle and I follow in an unmarked blue light, the policeman Steve dutiful and beautiful. 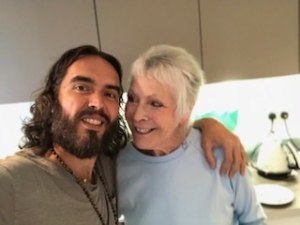 Six times my Mum has had cancer and six times she has recovered. Her spirit and whatever spirit it is that drives the NHS and those holy folk who work there. Sarah, a doctor in the bedside chorus at Resuscitation has good chat and in the edge land of those quiet and frantic places she smiles at me, the uninitiated. ‘Is he any good?’ I ask gesturing at Martin Griffith, she nods in a way that conveys the exact level of certainty I needed, absolute certainty. ‘He’s who I’d want if it was my Mum.’ I thank her, I say thank you a lot at the Royal London, not enough but a lot, what else can you say. ‘It’s why you pay your taxes’ she says. The operation is a success, all three life saving operations are successes. The careful, watchful, constant care is successful. I see why they call it ‘Intensive Care’, that’s exactly what it is in there, intensive care, strong and constant love from a roster of two hundred nurses, each one dedicated, kind, focussed and unfussy. A variety of backgrounds but as they fulfil their role at the end of my Mum’s bed, applying drains to her injured lungs, monitoring her bruised heart, feeding her, bathing her, the difference between care and love is difficult to see. Certainly my Mum, a veteran patient has colloquial ease with her carers. Even before she passes through the delirium she sees them as her allies. Even before she can speak, throat occupied by the fearsome ventilator she can communicate with them. And is it this spirit that grants them their shared language? Is the invisible force that keeps my Mum, not just alive but positive and loving distinct in any meaningful way from the love and devotion of these beautiful people? The spirit of this beautiful institution? The NHS is the best of us, it is our shared declaration that love is real. The National Health Service, it does so much and yet it means much more.